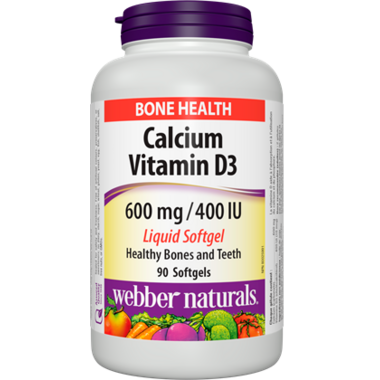 There’s a new way to get your daily calcium and vitamin D3 from Webber Naturals. A liquid-filled softgel delivery system makes it easy to get meaningful doses of calcium and vitamin D together (600 mg calcium/400 IU vitamin D3 per softgel), important nutrients for life-long bone health. Liquid in a quick-dissolve softgel is ready for the body to absorb! Free of artificial colours, preservatives, or sweeteners; no dairy, starch, sugar, wheat, gluten, yeast, egg, fish, shellfish, salt, tree nuts, or GMOs. Canadian brand. Recommended dosage (adults): 2 softgels daily a few hours before or after taking other medications or as directed by a physician.